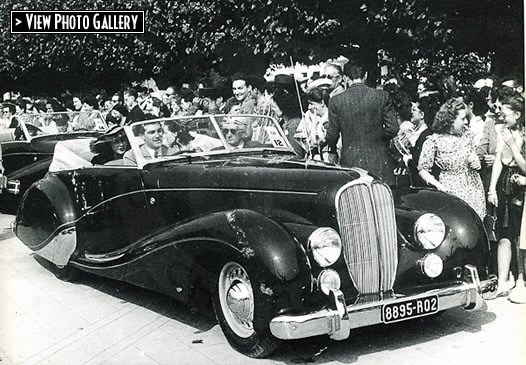 This Delahaye 135M, a touring Cabriolet, was built by one of the great coachbuilders, Jacques Saoutchik, in May 1948. The Delahaye features an unusual three-position Landau folding top, allowing a middle position (only the rear seats covered), and rear-hinged 'suicide' doors that incorporate the sweeping fender line. The 135 model was introduced at the Paris Salon in 1935 elevating Delahaye to the ranks of the great French marques of the 1930s and 1940s, along with Bugatti, Delage, Voisin and Talbot. The 135 featured a low-slung chassis for excellent handling coupled to a powerful and responsive engine. Preferred by the finest coachbuilders, this model was used to create some of the most stylish and remarkable streamlined coachwork ever built. Jacques Saoutchik, an expatriate Russian cabinetmaker, was known for his original, flamboyant and extravagant designs, his brightwork trim, his exquisite interiors and as the most expensive coachbuilder of his time. Owning one of Saoutchik's exclusive, streamlined bodies marked the height of social success, thus his designs were in high demand. After the war, Saoutchik continued to develop his streamlined designs, but economic conditions were difficult and the business struggled. Saoutchik designed the Partnership car to extend his market appeal. Unlike some of his most ornate post-war designs, the Partnership car reveals Saoutchik's talents in a more restrained and graceful mode. 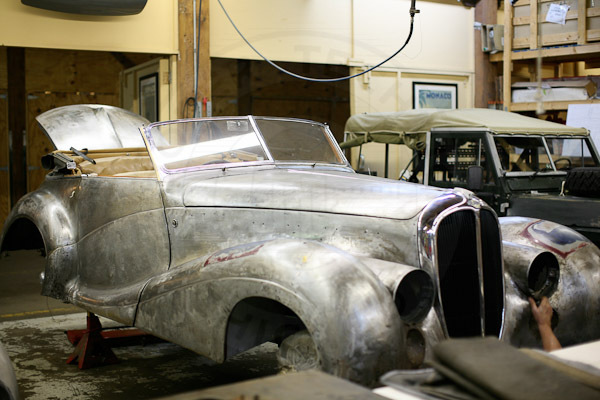 Saoutchik built our Delahaye on spec, hoping to sell it during the summer season of 1948. It was first shown at the Paris Concours d'Elegance on June 17, 1948. While it was not permitted to show a car twice in one season, the Delahaye was also shown at the Concours d'Elegance at Enghien des Bains the following week. In order to claim that he was showing two different cars, Saoutchik quickly changed the paint color from blue to black, and used a different license plate for each Concours. Not only did he get away with this deception, it confused future Delahaye historians. To confirm the story, Cooper stripped large patches of the surface paint on the car to reveal these two color layers. The black paint is a thin layer painted right over the blue without primer, and beneath the blue are the original primers and surfacers applied on the bare metal. Later in the summer of 1948 the car was shown at Deauville. Cooper learned that Suzy Prim, a well-known French film actress and B-movie femme fatale, purchased the Delahaye in the early autumn and owned the car until 1954. Cooper has fully researched the Delahaye's history and provenance, and its entire history has been documented. 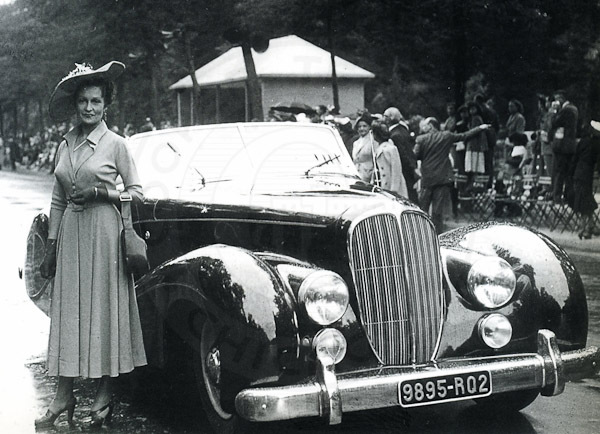 Here is a link to an excerpt from Peter Larsen's book "JACQUES SAOUTCHIK:MAÎTRE CARROSSIER" featuring a chapter about the 1948 Prim Delahaye. This Delahaye 135M, a touring Cabriolet, was built by one of the great coachbuilders, Jacques Saoutchik, in May 1948. 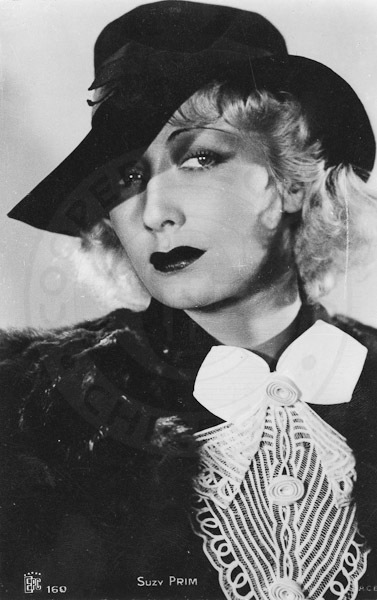 Suzy Prim, original owner of the 1948 Delahaye 135M Saoutchik Cabriolet, in a studio publicity photo. 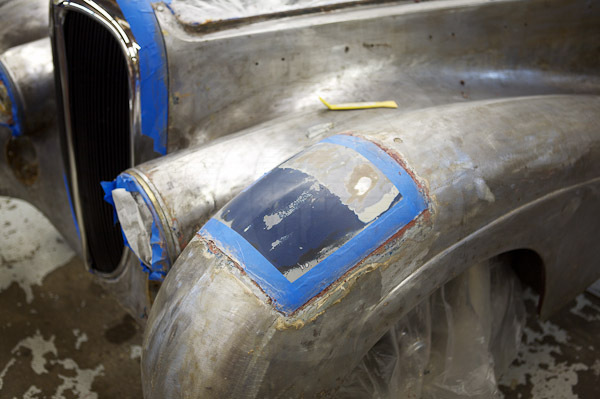 1948 Delahaye 135M after paint was stripped from the body. The original sheet metal is in very good condition. The original blue paint was revealed after we carefully stripped the top layers of paint.